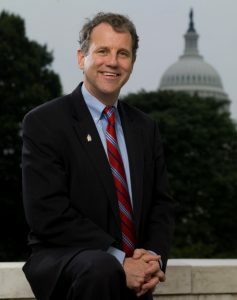 Ohio voters elected Sherrod Brown to the United States Senate in 2006, and since then, he has distinguished himself as a strong voice for fairness and a fighter against special interests who is committed to holding both big corporations and government accountable. Today he serves on committees that are key to Ohio’s future: the Agriculture, Nutrition, and Forestry Committees, the Veterans’ Affairs Committee, the Finance Committee, and the Banking, Housing, and Urban Affairs Committees. Key among Brown’s battles is his opposition to Washington Republicans’ efforts to sabotage healthcare coverage and increase costs on hardworking families. As a matter of principle, Sherrod refused to accept the generous congressional healthcare plan until affordable health insurance was available to Ohioans. He continues to stand up to insurance and pharmaceutical company lobbyists so we can make healthcare affordable for seniors, workers, and small businesses. Sherrod Brown also opposes Right-to-Work-for-Less laws. He has introduced legislation to prevent states from introducing these laws, which make it harder for workers to bargain for better wages and working conditions and which allow “free riders” to leech off of their fellow workers. In addition, Sherrod is a strong proponent of the current Medicare program as well as the current Social Security program. These two programs, critically important to working Ohioans, are prime targets for cuts by Republicans. The threat is real, and the danger that benefits will be cut or lost increases every day.